GenJet™ DNA In Vitro Tranfection Reagent is a powerful transfection reagent that ensures effective and reproducible transfection with invisible toxicity. GenJet™ is formulated by unique chemistry (covalently cross-linking cationic lipids with polymer), giving rise to exceptional transfection efficiency with distinguishable features in comparison of other types of reagents. GenJet™ was shown to deliver genes to various established cell lines as well as primary cells including HEK293, 293T, 293E, CHO, COS1, HeLa, NIH 3T3, insect cell lines (Sf9 and Sf21) and a variety of other eucaryotic cell lines. 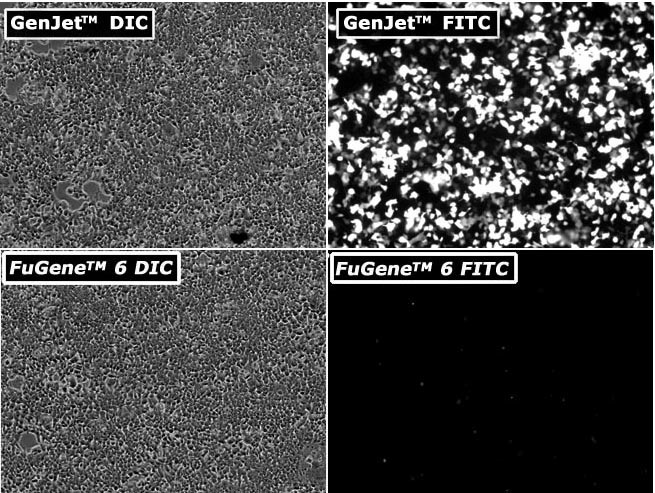 GenJet™ reagent, 1.0 ml, is sufficient for ~666 transfections in 24 well plates or ~333 transfections in 6 well plates.